SCREAM 3 turns 16, let's look back at the hype! Hey, it's February 4, 2016 -- you know what means? It means that SCREAM 3 is officially sixteen years old today! Feel old yet? I do. In the midst of season WitchDimension Films and its parent company Miramax are banking on a teen slasher film to put paranormal back in place finance one helluva holiday party. But its not just another flick--it presumably last installment trilogy that brought big budget horror from dead. Scream 3, the final stage of the beleaguered Sidney Prescott(Neve Campbell), features yet another batch of screen-friendly faces - franchise veterans Campbell, David Arquette and Courtney Cox Arquette, as well as new additions Parker Posey (The House of Yes), Kate Hudson (200 Cigarettes), Scott Foley (Tv's Felicity) and Matt Keeslar (The Last Days of Disco). Naturally, viewers can expect that someone wearing an all too familiar-looking costume will be spending some serious time with a cellular phone. With any luck, audiences won't be screening their calls. 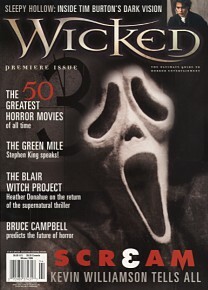 Trouble erupted this summer when Scream creator and teen guru Kevin Williamson left the project after submitting a treatment for the film. Screenwriter Ehren Kruger(Reindeer Games) was enlisted to finish the script, and reports indicate that Laeta Kalogridis also contributed to the final screenplay. Williamson says that his departure had nothing to do with the misgivings about the Scream franchise; he was simply to busy to tackle another assignment. "I wanted to do Scream 3," Williamson explains. "We all wanted me to do it. But we all sat down and decided that I didn't have time. I didn't want to push the movie up earlier because we would never get Neve and Courteney. They have a TV window they have to work within. So we had to make the movie during the summer. I couldn't write it because I was in the middle of directing Teaching Mrs. Tingle and doing the pilot for Wasteland. So you know, I had to make a decision. It was hard. Ehren Kruger is writing it, and he wrote a great read." While Williamson's self-referential style might not be as pervasive in the film, his name will remain in the movie's credits. "I am a producer on Scream 3, but I think that's because they're really nice to me. I shot Wasteland on the same lot as Scream 3," he continues. "I could look over and see them shooting Scream 3, and I [would] just kind of wave. It really is sad, but it was a family decision. We had to get together and work it out. Now I'll be an audience member." Despite bumps in the film's production and the changing tastes of the horror movie going public, Williamson is confident that Scream 3 will meet the unmitigated success of its two predecessors. How can he be so sure? "We've got [legendary genre director] Wes Craven, and I'm sure it's going to be great," he says. "My money is on Wes. This movie is going to rock." Article taken from its originally publication on the late Scr3am.net. Next up, we're going way back. 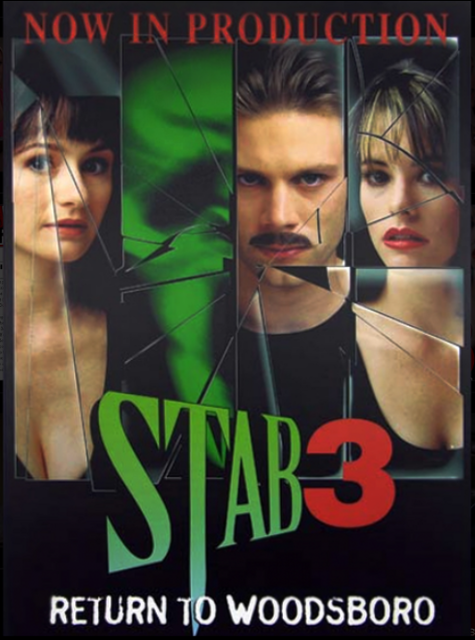 These were the first two images of anything SCREAM 3 related that were ever made public. This first image is a single page black-and-white ad scanned from Variety during the summer of 1998. Yes, that's correct! It was originally slated for release on December 10, 1999. Next up, here's a "new" logo that was revealed at ShoWest sometime in 1999. This was the first instance that the "3" was used as an "E" in the title: S C R 3 A M.
Thanks to the late Scream-Trilogy.com for the images! And let's not forget SCREAM 3's unforgettable viral marketing campaign -- really, the first of its kind! Take today to celebrate the fact that SCREAM 3 is eligible for a driver's license now.